Amstelveen is a municipality in the province of North Holland, Netherlands consisting of the historical villages of Bovenkerk and Nes aan de Amstel. The name Amstelveen comes from the Amstel, a local river, and veen, meaning fen, peat, or moor. To us Birmingham is of more interest. England played a statistical milestone test at a ground where they have remarkable 27 wins from 50 Tests - Edgbaston is the venue opening Test of the series against India, where they won the toss and elected to bat – ended up 285/9 on day 1. Edgbaston Cricket Ground, home to Warwickshire County Cricket Club is in Birmingham. Birmingham is a city and metropolitan borough in the West Midlands of England. By 1791 it was being hailed as "the first manufacturing town in the world". The modern Birmingham is a major international commercial centre, It possesses three universities and two university colleges make it the largest centre of higher education in the United Kingdom outside London. Edgbaston traditionally has a reputation for being one of the most highend, upmarket and/or affluent parts of Birmingham. Team India does not have a great record here – it is their 7th test – in the first between the teams here in 1967, England won by 132 runs; in 1974 under Ajit Wadekar India lost by an innings & 78 runs. In 1979 under Venkatraghavan, India had another innings defeat; in 1986 Kapil tasted a draw in otherwise successful tour; in 1996 lost by 8 wickets and in 2011 – another innings defeat. Today India played 4 pacers – Umesh Yadav, Ishant Sharma, Mohamad Shami and Hardik Pandya and the offie Ravi Ashwin. Way back in 1967 – the attack was opened by Budhi Kunderan, otherwise a Wicket keeper along with Venkatraman Subramanya, a leg spinner – the other bowlers were Bishan Bedi, Bhagwat Chandrasekhar, Erapalli Prasanna and Srinivasan Venkatraghavan – yes 2 leggies; a left arm spinner and two off-spinners though Venkat was given 13 & 2 overs ! So a home test, where England were brimming in confidence – Kohli lost the toss, dropped Cheteshwar Pujara, picked only one spinner, and though he had new ball bowlers brought on Ashwin on in the seventh over of the Test. Ash with 315 wickets (fastest to take 300 test wickets beating Dennis Lillee) has not been in the scheme for a while – came in to reckoning almost immediately bowling Alastair Cook with a peach – a floated offbreak at around 55kph. 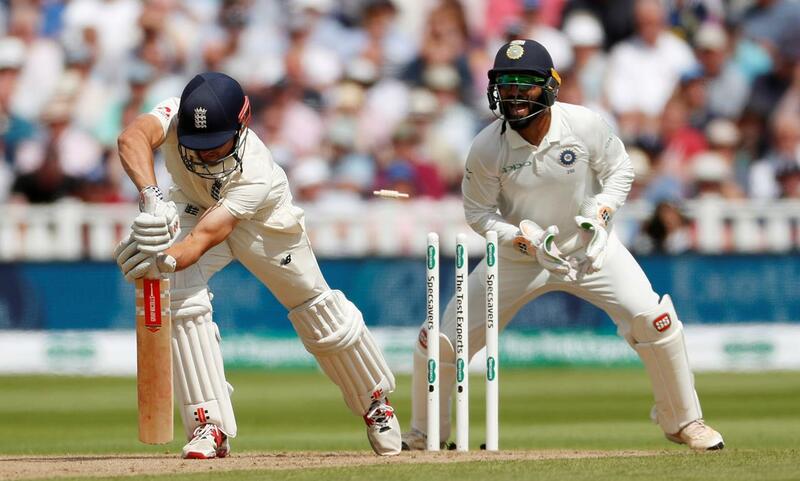 The ball maintained its middle-and-off-stump line as Cook leaned forward to defend, ball landed on the seam, bounced turned enough to beat outside edge of Cook's bat before it hit the off stump. Still England were coasting along – Virat picking up turning throwing a direct hit to catch Joe Root out of crease gave the impetus. Ashwin now has 4 needing that last wicket to have yet another milestone of becoming , took out the dangerous duo of Ben Stokes and Jos Buttler. He ended the day needing one wicket to become the first Indian spinner to take a five-for in England since 2002. England ended the day at 285 for 9, having at one stage been 216 for 3. Sam Curran is at the crease playing his 2nd test – his brother Tom Curran, his fellow Surrey all-rounder, and son of the former Zimbabwe cricketer Kevin Curran, has already excited hopes that he could develop into an influential allrounder. Kevin Curran their father played for Zimbabwe, played in 3 ODIs against India – 2 of them in 1983 WC – in fact triggered that famous collapse of India to 17/5 when Kapil’s magnificent 175 n.o turned the table. He later played in Reliance Cup 1987 match at Chepauk against Australia and remember standing much shorter at short cover effecting couple of brilliant saves of full blooded drives. Sadly, he passed away at a young age while jogging ! Elsewhere at Amstelveen, Nepal captain Paras Khadka's sensational four-wicket haul gave the ODI debutants a stirring start, but his opposite number Pieter Seelaar answered the challenge with a stifling spell of left-arm spin to defend 189 in a 55-run win at the VRA Ground, denying Nepal's effort to become the seventh country to win their maiden one-day international. Statistically, this first Test between India and England is 1000th test for England. England’s first ever Test match was played when a team arranged and led by James Lillywhite played Australia between March 15 and March 19, 1877. That was also the first ever Test match to be played between any two teams. England have won 357 Tests and lost 297 Tests with 345 ending in draws.